I've been looking into Biochar as a means of improving my garden soil and I decided to try making and adding it to the soil. All Biochar is made by heating any organic materials such as plant material, husks, dried manure, leaves, nut shells, in low oxygen conditions. Charcoal has been made for a very long time and Youtube is full of examples. 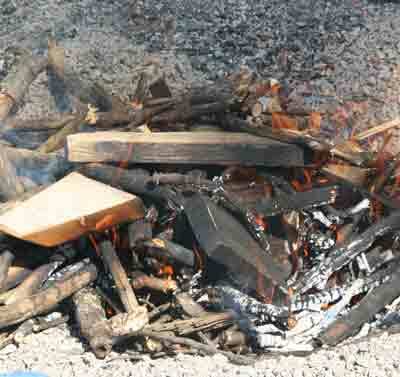 Most are aimed at making BBQ charcoal but the process is much the same. I have a link on the left of one of my favourite video. I decided to try this first. It's simple and works. 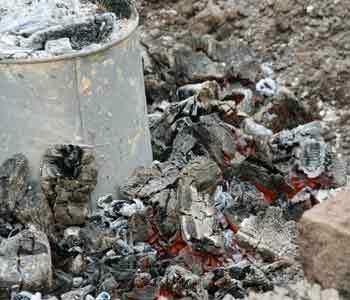 There are also many directions for making charcoal by putting biomass in an open container and inverting this inside another such as a steel drum in which a fire is burned. The wood (or biomass) inside the upside down container chars and after the big fire dies down and everything cools the small container would have charcoal in it. I thought I would also try this but instead of using a steel drum I would simply build a hot fire in a shallow pit with an upside down container of wood in the middle. After the fire had had a chance to burn for a while I would shovel some sand over the whole lot and let it smoulder and cool. Hopefully I would get charcoal from the big fire and charcoal inside my up side down container. 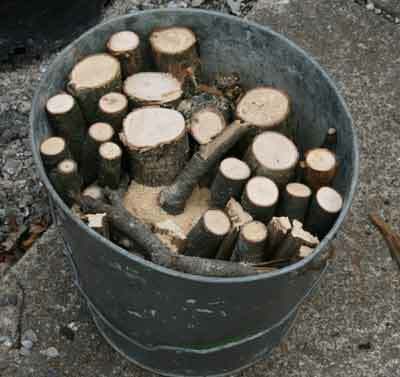 Here is a bucket of wood I prepared. It's from a brush pile and the wood is quite dry. It's mostly hardwood such as hickory. I've dug a shallow pit in sand/gravel and have put together lots of small branches and a few spruce cut offs. After inverting the bucket in the pit, I built quite a large fire over it. 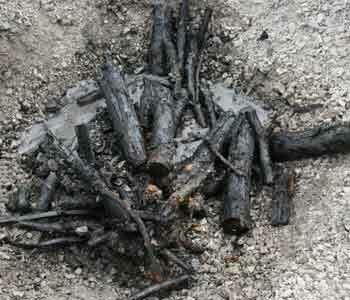 The small hardwood branches and the spruce chunks burnt fast and hot. I kept the fire going for about an hour. I let it burn down until there were some nice large glowing coals and no more big flames. At that point the fire was very hot with lots of glowing chunks and I was getting hungry. Also the wind was building up with a strong wind warning for lake Erie. I had the garden hose standing by for safety and I did not leave the fire unattended. I shovelled enough gravel over the fire and the bucket to stop the fire but there was a small amount of smoke seeping out. but that quickly stopped.I checked that the fire was no danger and since it was dark already I went in. 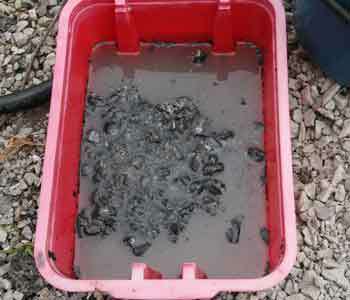 The next morning I shovelled off some gravel and found that there was quite a lot of charcoal around the bucket. Some of it was still smouldering. It was difficult to separate the charcoal from the gravel so I threw everything in a container of water and all the charcoal just floated nicely. I scooped it out easily. 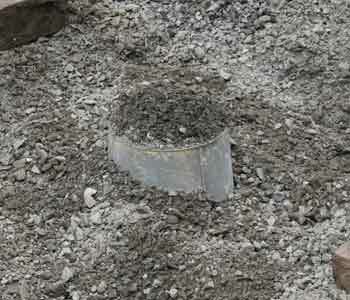 It was also safer than trying to root in the ground because some bits were still very hot. The wood in the bucket had not had enough time to char properly and had a lot of wood still unchanged. Small branches were ready but the larger wood would have required another hour in the hot fire. 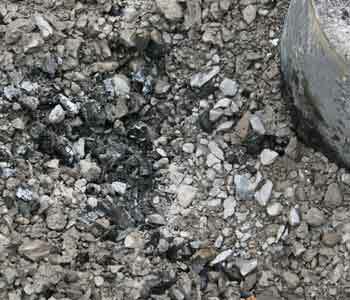 The remains of the fire made a lot of charcoal and I had a half rubbermaid container full by the time I had finished. I got about twice the amount shown in the photo. I was very pleased with myself. In this experiment I was only trying to make charcoal. The heat from the fire was mostly lost as were the flammable gasses produced by the charcoal making. I wondered if there was a better way I could make charcoal and get some usable heat. 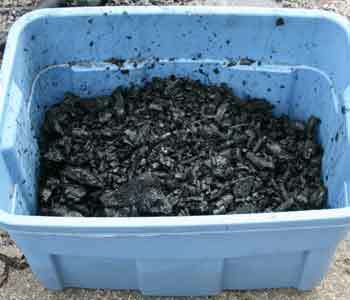 See my next biochar making experiment. Here is an English chap making a batch of charcoal for use in BBQ. It's very dramatic and fun to watch.